Rattling on the tracks, wheezing of steam, and grinding of gears as the engineer navigates from train-to-train—Gregorio Prestopino’s Donkey Engine invokes these noises. 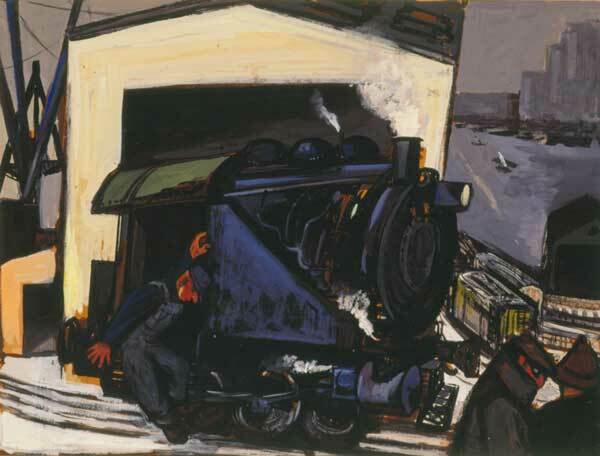 This painting communicates the radial churning of pistons around wheels easing this once majestic vehicle to a halt in the foreground of a train yard. In the background to the right, subway cars and boats repeat their daily routine. Born in the Lower East Side of New York City at the turn of the century, Prestopino is understood as a social realist because of his depictions of the grit and toil of city life. Here Prestopino draws attention to the docks and workers of the Lower East Side, highlighting labor vital to the city’s existence, yet often overshadowed by the glamour of urban life.